A selection of useful tidbits of information for the aquarist. Readers are encouraged to send their tips to terry@advancedaquarist.com or to post them to our Hot Tips sticky in the Reefs.org General Reefkeeping Discussion forum for possible publication. Next month’s Hot Tip theme will be “Quarantine Tips“. Drill the LR with a rock drill, and stack them up pvc tubes to build high but stable structures. Do not try to create a berlin wall, but use one or more loose structures, surrounded by sand. Maybe the most important: less is more! If you are first setting up tank try to set up rock in dry tank with substrate in first. Place largest heaviest rocks in first and build up. Utilize unique pieces to add creativity to your tank. Arrange rocks on your floor in order of size and look for unique shapes and pieces that will stand out or provide good coral mounts and set them aside to be used later as you begin to build your reef formation. Draw on paper beforehand what it is you hope to achieve. Have some ideas in mind regarding height, caves, bridges, coral mounting points, coral mounds etc. Keep in mind that no matter how thorough you plan, you will always redo portions of your aquascape as you aquire corals or discover a new look that appeals to you. When building keep in mind basic things like fish need caves to hide and sleep in. Tightly packed rock will make it difficult to move later or adjust if you are trying to place a coral. Slope is important to allow easy location of corals. Height is important to keep in mind if you want to have variety of lighting situations for variety of corals. Keep some spare rock in sump or behind or away from main viewing area in the tank so when you go looking for piece you wont have to remove one from another area. If you want to carve or create special pieces a hammer and stone chisel will work wonders. Work slowly and remove small pieces…trying for that one great hit usually shatters the rock into more than you wanted and less useful than you expect. There is no ONE correct way to aquascape. There are only opportunites look for them in the rock. Setting up dry allows you to explore them with out all the mess of water dripping everywheres. And when its time to fill tank place a series of bowls large to small in tank and fill largest and let it cascade over. This allows water to enter with minimal sand disturbance. A rotary tool such as a “Dremel” can come in very handy when aquascaping. Many times you’ll find rocks wont sit in a particular spot because of a section(s) sticks out and keeps it off balance. Being able to accurately cut and carve your rock really helps in fitting them to the place you want. In addition you can angle cut rocks to fit into corners or around overflow boxes. I’m not a fan of using PVC and such for rock support in a reef tank. I tried it and it wasn’t worth the effort. (others have had decent results) Instead I switched to a mix of Tonga Branch and Fiji. The tonga branch is excellent for making supports for caves and bridges or outcrops — very natural looking as well. If it’s an option see if you can get a deal on tonga branch base rock which is still live, just little to no coralline. Often vendors will give you a good deal on it as its unsellable to them. Tonga branch is also pretty easy to cut with a saw if needed. I think a lot of people try to save money on live rock, and end up with a bunch of smaller pieces that they have to play ‘Jenga’ with. However I would suggest spending the money and buying several larger ‘show pieces’ of live rock. Several bigger rocks make aquascaping more stable than trying to stack a bunch of little ones, and also lend themsleves to easy to build visually appealing designs. Not sure if it applies to aquascaping tips or not, but the best way to aquascape well in my opinion is to start with a wide tank. It is almost impossible to make anything look decent in a narrow tank like a 55 gallon IMO. No space for ledges, caves, etc. All you can do it make a wall o rock. Small pieces of rock can be used on the bottom to flesh out some areas. An overhang can be made to look like a cave by just laying rocks along the bottom on front of it. Sections can be made to jut out by using small rocks on the bottom to extend areas that stick out a just a little bit. The best advice anyone can give on aquascaping is once you finally get the rocks in position the way you want, leave it alone!!! I can’t tell you how many times I have spent hours cursing and trying to get a piece of a rock to fit back the way it was 5 minutes before, when I moved it for some reason such as trying to save a fallen frag. Aquascape your tank and just let it be. I like to drill the rock and insert acrylic rods to create legs that suspend the rock off the bottom glass. This saves on the cost of base rock and acrylic is smaller than PVC. My expierence with aquascaping my tank is one of a learning expierence,i used to just pile it up and hope it looked good by the time i ran out of rock,however recently after doing some reading and looking at other tanks i took 3 pieces of 5” pvc pipe and let it stick out above my sand bed and then i bought a 2ft. perfectly round stone “walkway block” and set it on top of the pipe on a slight angle(very stable base) then i took my largest pieeces of live rock and built up on a slope it was the best investment i have made yet and the height and form is very nice,now im completly happy and the water current has improved between sand bed and my reef plus theres a great shelf under neath for my mushrooms(lo light) and starfish and other critters that do not like my 400watt halide!!!! Learn to do puzzles, all the pieces have a place! I just got done aquascaping my tank for the final time. I like the result this time and I think I learned something on my own, though I am sure someone somewhere has mentioned it. I started the project apprehensively and was beginning to regret starting it. I have been feeling a bit non-creative as of late and everything seemed to be fighting me. Once I had put my largest pieces on top of some smaller chunks providing elevation off the sand and all things being in the areas I recklessly decided upon, I then tried to give some illusion of depth from front to back… There isn’t much to work with in a 90g. I decide the best way to attempt this was make two seperate ridges running the length of the tank. Of course, the shorter ridge in front and I decide it would be best if it weren’t continous ridge. Nothing was working for me until I chose to add accent lines to those that already existed in the rock work. If there was a ridge upon a large chunk of rock I would find a way to place another small chunk next to it and carry that line farther in the direction I thought it had to go. Right now I have a tank of murk, but I hope it looks as well in the morning as I seem to think it does right now. Place smaller pieces of rock on the bottom of the tank and use them as supports for larger pieces; sort of like legs on a table. This keeps large rocks off the bottom and helps create an open structure. Back fill with sand AFTER the rock is in place. The sand acts to stabilize the structure. Don’t place rocks on top of sand. They’ll move as they settle into the sand. The bottom rocks should not tip or rock from side to side. The bottom rocks are your foundation and should be as stable and large as possible to prevent rock slides. Next I went through all the rock I had looking for unique open shapes. I placed these closer to the front and used the denser rocks as fillers for the rear. I stacked them in such a way that they were not stacked tightly like a brick wall but open, with lots of crevices and hiding places. Then I added the sand to the open area in front of the rock and pushed the sand back around the rocks and crevices. Sure you lose a few inches of rock after the sand is added but it is very stable. I tend to keep it simple. At first, I would try to get creative with rock placement due to the lack of pretty things to look at — corals, fish, etc. 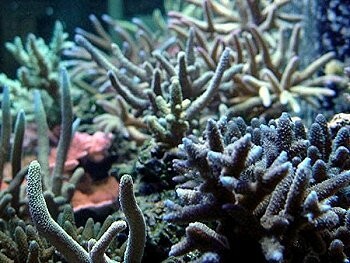 I would create peaks and arches that were close to impossable to attach corals to. I found out the hard way once the tank matured and I purchased some corals. My recent tank contains simple rock placement: lots of flat rock work with plenty of user friendly spots for coral placement. In my opinion, rock work/aquascaping is only a platform in which to display the true beauty: livestock. Anyway, the corals will in time grow over the rockwork and obscure it anyway.